More than two weeks have passed since the illegally constructed Rana Plaza building complex collapsed on the outskirts of Bangladesh's capital Dhaka. The building that housed five garment factories trapped thousands of industry workers, killing over 950, with the death toll still rising. The collapse, which was just another accident ready to happen, has put US and European fashion industry that use low-cost Bangladeshi sweat shops under fierce criticism from activists and consumers regarding the working and safety conditions of garment workers in third world countries. While several brands quickly acknowledged their links to the factories, like UK’s Primark and Canadian Loblaw, that owns the Joe Fresh fashion label and are now offering compensation to the victims, other brands according to Clean Clothes Campaign, like Bon Marche (UK), El Corte Ingles (Spain), Mango (Spain) while Cato Fashions (USA), Children’s Place (USA), Carrefour (France) have yet to step up despite also being linked. Italian multinational Benetton initially denied any links, despite photographs showing shirts labeled United Colors of Benetton in the middle of the rubble and paperwork found. 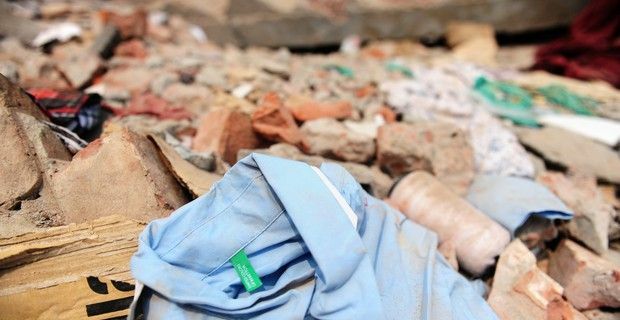 Going into damage control, Benetton has now confirmed it had purchased 200,000 shirts from New Wave, one of the five manufacturers that operated inside the collapsed building. "The New Wave company, at the time of the tragic disaster, was not one of our suppliers, but one from whom our direct Indian suppliers had subcontracted two orders," said CEO Biagio Chiarolanza to The Huffington Post. Bangladesh's garment industry is ranked the second-largest in the world after China and is worth $20 billion and sixty percent of Bangladesh's garment exports go to Europe, 23 percent to the US , five percent to Canada. Could you be the new face of Benetton?